Once you visit Bungie.net you’ll be asked to log in with your PSN or Xbox Live ID and given the opertunity to download the iOS or Android Destiny mobile application. Initially this seems like an innocent extra that promotes a type of metagame experience alongside the regular game. But Destiny is another game in a worrying trend that removes content from the main game in order to justify out-of-game experiences. If you haven’t played Destiny then feel free to take a peek at our review, in which Randy so eloquently points out the failings of the games storytelling. It’s not that the story itself is bad, especially when you consider that it’s supposedly just the beginning of a 10 year long journey. But there is so little of it that you don’t even get the chance to care. At the beginning of the game you’re resurrected by a Ghost, an AI companion that was supposedly “made in the light of the Traveler”… whatever that means. Before he de-materialises into your head he informs you that you’ve been dead for a long time and that most of what you see won’t make any sense. Which is true, nothing made any sense to me, at all. Now you’d think that since you have a constant AI companion with access to all the worlds knowledge he could…you know…catch you up a little bit. But instead all you get is vague references to in-universe historical events that led to today’s state of affairs, none of which are fleshed out. 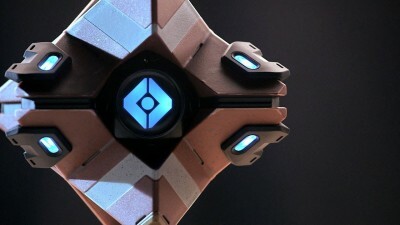 The Ghost is voiceed by Game of Thrones actor Peter Dinklege, EG staff have nicknamed him the Dinklebot. The Traveler, a giant white orb hovering above the last city; provides mankind with the magical force known as light. It is the main plot device of the game and has a representative known as The Speaker. A person whose sole purpose is to communicate for the Traveler, and just between you and me; he’s pretty bad at his job. You visit the Speaker twice, once at the start of the game and once at the end. The first time he, I kid you not, actually lists all the backstory he could give you instead of actually telling you; “I could tell you about x, or how x happened, or what x is”. The second time you meet he congratulates you on defeating the forces of darkness and saving the Traveler, something that in a general sense you know was a good thing (“the forces of darkness” was a big hint), but after finishing the game you’re no closer to really understanding why anything is happening, not to mention how. I can count on two hands the amount of cut-scenes in the game, and none of them were particularly long, fulfilling or illuminating. Most of the exposition is delivered during loading screens in between missions, and most of that only concerns itself with the immediate plan for completing the next objective. So where did it all go? Did Bungie really promise ten years of Destiny games, updates and expansions without first writing a cohesive narrative with a rich backstory? Well surprisingly Destiny actually has a fair bit of backstory, most of which is told through the Grimoire cards you earn through completing objectives and reaching milestones. The Grimoire cards are split into categories like places, events, classes, enemies, ect. Each card has a picture face and text face, the picture usually being some depiction of the cards theme and the text being some form of backstory, explanation, or curiously even direct quotes from characters in the game; sometimes reading like they’re a response to questions asked by the player. 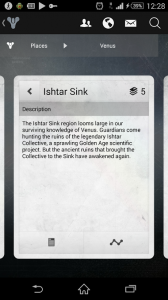 A lot of the information revealed in these cards would have gone a long way in helping establish the world and its characters. What the Grimoire cards look like in the Android app. Forgetting for a moment how unappealing it is to read text snippets in a cinematic game released in 2014, the option to do so isn’t even there. The only way to read these Grimoire cards is to visit the website or download the mobile app, both of which aren’t exactly a joy to navigate. Let me reiterate, 90% of the story content in Destiny isn’t actually available INDestiny. It’s a shame too, because Destiny has a lot of really great (and famous) voice actors that could have done this universe justice given proper direction. You’ve got Nathan Fillion and Gina Torres of Firefly fame. Shohreh Aghdashloo who played a relatively big role in Mass Effect. Then you’ve got Peter Stormare, Bill Nighy, Lance Reddick and of course Peter Dinklage. Makes you wonder why Bungie would go out and get famous actors in high demand to voice characters in their game if they were barely going to be saying anything. The game is begging for a dialogue system akin to Mass Effect or Skyrim, and with the very limited cast of characters in the game, it wouldn’t even be that hard to do. We’ll probably never know for sure why the story in the game is so bare bones or why the Grimorie cards aren’t readable in-game , but right now I only have one thing to blame and it fits nicely in with my paranoid conspiracy theory; COMPANION APPS ARE RUINING GAMES! Because it’s not just Destiny, and it’s not just removing content. In Battlefield 4 you can play as a commander on your phone or tablet, you can do it on PC and consoles too but why would you want to when you can have a lot more fun as a regular soldier. On the surface this is a great use of a companion app; give players a way to interact with the game while they’re away from their systems. And while the commander mode has history in Battlefield games, the one in BF4 kind of ruins the fun for the regular players. Playing as a commander in BF4 is all about information warfare, scan the battlefield for enemy players and/or hide your team members with EMP curtains. 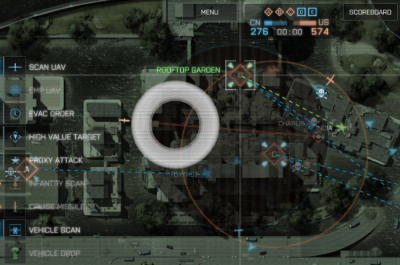 Thing is, the commanders can do this so often and in such a wide area that on servers that allow the mode there are rarely times when you aren’t either clearly marked or impossible to mark on the minimap. At the same time you’ve got all kinds of gadgets for the soldiers designed to reveal enemy players (TUGS, MAVS, Motion Grenades and SOFLAMS) on a smaller scale, and attachments like silencers and flash hiders designed to hide you from the minimap. All of these are now useless as long as the opposing team has an active commander. Look at the size of those affected areas! While in Titanfall Xbox One owners got a second screen feature that allowed them to display full maps in real time, giving the position of enemy players as well as access to special filters. PC players have access to the same app, but these notable and useful features are blocked from use by anyone not playing the Xbox One version. Undoubtedly in an effort to persuade Titanfall fans to spring for the tumultuous console. This doesn’t remove features from the main game as much as it artificially differentiates versions of the game, it’s less shady than previous examples but still noteworthy. But, it’s not all doom and gloom for the companion app. There are good ones out there. Ubisoft seems to be the shining light in this case. With both Watch_Dogs and Assassins Creed 4: Black Flag having fantastic companion apps. Both offer unique experiences on the mobile platforms that add to the game rather than detract. In Watch_Dogs’ companion app you can take on the role of big brother and harass the player by controlling things like red lights, roadblocks, or you can even go for the kill by sending police cars and attack helicopters after him. In Black Flag’s app you gain access to the minigame Kenway’s Fleet, a game that’s also available on the full versions of the game, but makes much more sense for a mobile device. In it you send your fleet on trading/pirating runs around the world, having to defeat fleets of pirate hunters in turn based point and click combat. Both of these apps add valuable experiences to the main games that makes sense having access to when you’re away from your home system. 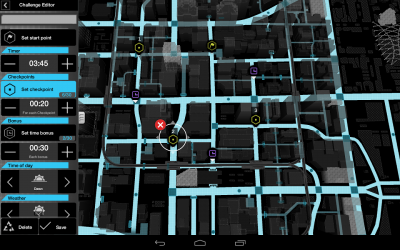 Watch_Dogs’ immaculately designed companion app. In the end most companion apps are relatively innocent, with apps like the WoW Armory and Call of Duty Elite being prime examples of harmless companion content. And games like Tom Clancy’s The Division looks like it might have an interesting companion app, cementing my belief that Ubisoft really is killing it on this front. But here’s hoping developers wise up and look at Destiny, Titanfall and Battlefield 4 as examples of what not to do with companion and second screen apps. Instead of interpreting their high sales as having anything to do with how their mobile apps are designed, because if the trend continues I fear we’re in for a depressing future. The opinions expressed in this article are solely those of Mats Paasche, and not at all representative of Elder-Geek as a whole. If you disagree with anything in the article I have it on good authority that Mats likes to debate in the comment section, or alternatively you can email him at matsp @ elder-geek.com (remove the space).